For an early Christmas gift, Davey received a brand new smoker right before Thanksgiving of last year. Immediately Nora Beth labeled it “Daddy’s robot.” She always likes to check and see what the robot is up to and has recently learned of the delicious fruits of its labors. Last weekend, she was thrilled to receive a bowl of what she called, “robot meat” (otherwise known as smoked brisket). Yesterday after her nap, she requested a “bag of robot meat.” “It’s not chicken!” she declared. “it’s poke!” She was right, of course (because she is never ever wrong), it was smoked pork. Thankfully, in addition to her fresh robot meat, she is also a happy eater across the board. Her favorites include smoked salmon, cauliflower, any kind of fruit, nuts, broccoli and yogurt. I also tend to have some sort of baked good in the house due to her affinity for helping me. 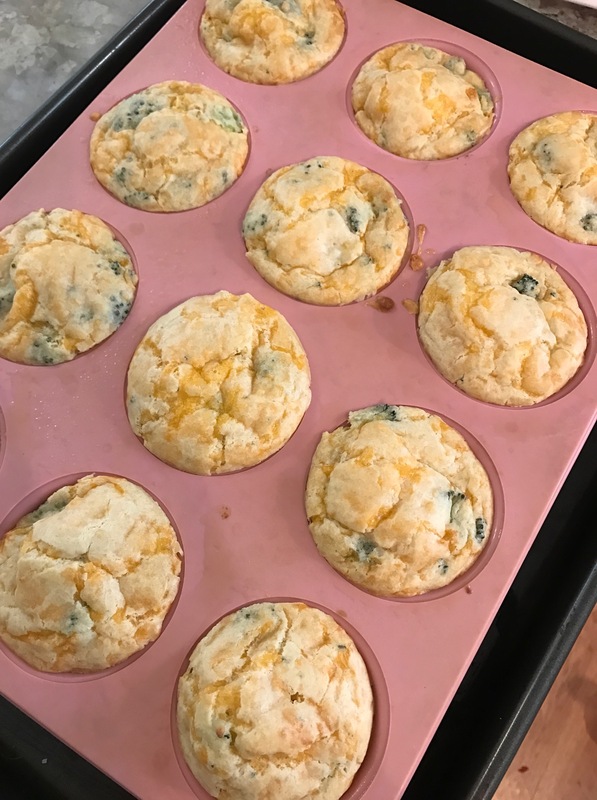 I was thrilled when I came across a recipe for savory broccoli cheddar muffins, and because I can’t seem to keep from getting CUHRAZY on Saturday nights these days, I whipped up a batch. These are highly toddler approved, but let me assure you, they are grown up approved too. Hot damn. They’re delicious and would make a delicious breakfast or dinner addition. Preheat oven to 375. Melt butter in a medium sauce pan over low heat. Once melted and slightly cooled, stir in remaining ingredients. Divide evenly between greased muffin tins. Bake for 25 minutes.